Social dance? Hahaha, isn’t that for like, old people? You know, or those tarted-up celebrities on TV? Okay then, if you say so. But at Nunokawa Dance Company, here on the Kappabashi kitchenware strip, television culture doesn’t exist. Neither Chie or her husband Izumi Nunokawa, pictured, watch those shows. And yes, among the students you could say is a scattering of uh, seniors…But. You might as well face it. The way time is flying…why not get practicing? You stopped in out of curiosity. A ten-ticket package, she said, Come anytime, just like making an appointment at the dentist. You started with blues, rhumba, a little waltz. Now tango, mambo, chachacha. It gets you in, this half-hour a week in the long thin room overlooking the temple garden. Like another space in your head. There’s a story in the steps, an Arabian Nights. Just when you think you’ve grasped it, Chie shifts the chapter ending and tacks on another paragraph. She seems to have a sixth sense about where your feet are going. As you’re moving, a stream of cheerful instruction and reminders. Keep your head up, the turn is coming, look out toward the temple, oop there’s temples everywhere. She bursts into applause after a successfully remembered sequence. She moulds your arms and head position as if you were a Ken doll. There’s a story in the steps, an Arabian Nights. Just when you think you’ve grasped it, Chie shifts the chapter ending and tacks on another paragraph. She grew up around the corner in Tawaramachi. 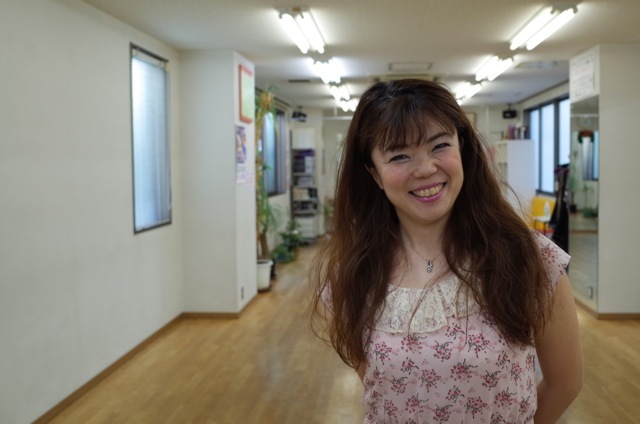 She started social dance in 1991 after her doctor stopped her from doing ballet. Izumi is from Niigata. They met about 20 years ago at a jazz dance school in Yoyogi. They found this space and Chie’s uncle, who is a carpenter, put in the sprung sakura-wood floor. The room is a bit narrow and we’ve thought about moving, she says. But the owner who is on the sixth floor is a really good guy. And not only that, but we’ve got trees on that side and windows on this side too, so you feel light when you come in here and that’s important. You can even see the Sumida fireworks from the front. In 1999 she and Izumi placed second in the All Japan contest. The same year they danced in the major contests in Blackpool, at the UK Championships, and the London International. We reached the finals in all of them! she says. She doesn’t compete now but when not teaching or judging, dreams of eating mussels steamed in wine on Rottnest Island off Western Australia. Nunokawa Dance Company is near the intersection of Kappabashi and Asakusa Dori.